After seeing her Poppy Seed Macarons I must said, I really fell for it. Because like what she and I agreed with, poppy seeds can also be used in other area rather than the usual Cakes and Muffins. And we do proof that, it actually fix well in this macaron and the texture was wonderful. It's so addictive that you will not want to lay your hand off it, because when you munch in your mouth those poppy seeds seems to be jumping around in your tongue. For my case, I used Orange Butter Cream together with some extra dose of poppy seeds to make the overall texture more "poppy". Next, I also try out another flavour on Green-Tea with Red Bean Butter Cream. At first I was still wondering what will be the taste like to mix butter cream with red bean paste. But finally when the product is out, the taste is just great. 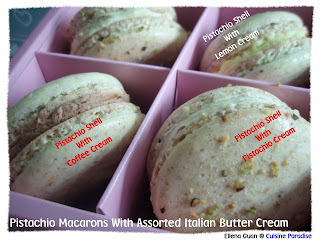 The fragrant of the red bean butter cream just blanace well with the green tea shell. As you can see, the red bean paste that I am using are not those very fine type that used for Asian dessert and kueh. I used the Japanese Red Bean paste which come in the can from those supermarket. And I find this taste great as you can see munch some of the whole soft beans in the cream. This do provide some extra texture to the cream itself. I have saw and heard a lot of good comments on the Baked New York Cheesecake(flourless version), even my colleague's wife also strongly recommend me to try on this. So without any hesitate, I baked after getting hold of all the ingredients. And I must said, the result is really fantastic. The texture is so smooth that it really melts in your mouth when you eat it. The original one is just baked cheesecake with white sour cream on top. But for me, I am a person who loves Vibrant Colours. So I added some yellow to the sour cream mixture and make it look sort of like custard. Other than that, I also pipped some Rose Scented Cream Cheese to go with some fresh Strawberries and Cherries to enhance the flavour and colour of the cheesecake. 1. Preheat the oven to 180 degree. 3. Next add in the eggs(lightly beaten) gradually in about 4 - 5 interval and beat well with each adding for about 2 minutes. 4. Add in the lemon juice and zest then stir till well combine. 5. Finally stir in the melted butter and pour the mixture into a prepare "7" round tin(i used a 8" springform tin) and bake for about 30-35 minutes. 6. While baking the cake, cream the 35g sugar with sour cream until sugar is dissolved then set aside. 7. When the cake is done(brown in colour), remove from the oven, switch off the heat and close the oven door. 8. Pour the prepared sour cream mixture in the middle of the cake and then put the whole cake back into the oven and let it continue to heat up using the remaining heat from the oven for about 10 - 15 minutes. 9. Remove, and set aside to cool completely before decorate it with extra cream or fresh fruit to serve. a) If after 30 minutes the colour of the cheesecake is still very pale, increase the oven temperature to 200 degree and bake till golden brown. b) For my yellow colour sour cream mixture, I added about 1 teaspoon of yellow food colouring and beat till well combined. A special gift for a special friend. Tomorrow is one of my best friend Christina's Wedding Day. So I thought of making something "In" and different for her as a small gift. 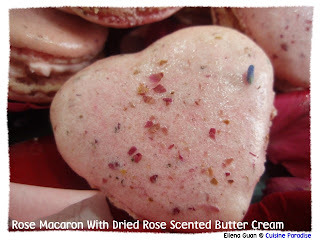 After going through a long search of my recipe lists, I still settle to make macarons but I designed something romantic for her. 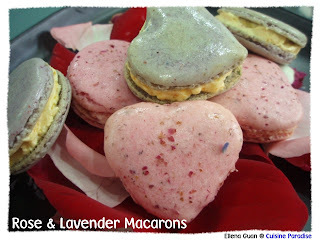 I come up with these Rose & Lavender Macarons in Heart Shapes version. In this special day of her, I hope to send her my best and warmest regards and hope that you will be the most Prettiest and Happiest Bride. 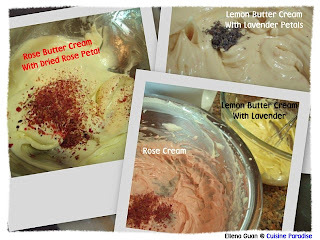 I made the Rose Scented Butter Cream with grinded dried rose petals to make the cream more fragrant and with it's natural nice pinky colour. 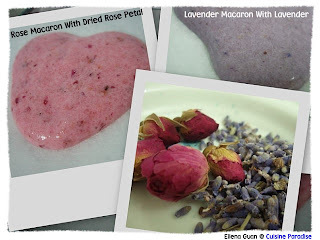 While for the lavender shell, I made the Lemon Butter Cream with some grinded Lavenders to enhance the lemon flavour. And these two flavour really infused my whole kitchen will wonderful aroma. 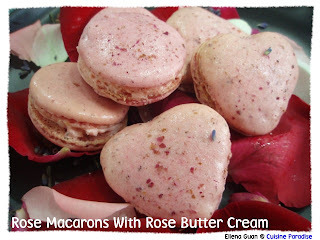 I had never thought that these two lovely flowers really make a great pair when making macarons with them. They have wonderful colours and fragrant that makes you want more of these additives goodies once you sank your teeth in them. But as for my Lavender Macaron, I think that the colour is not good enough as I can't actually achieve the voilet colour that I want after baking. It turns out to be slightly towards the greyish side. Hope next round if I had a chance to try this again, I can achieve a better colour for it. Some of you might found this page familiar at Today's Sunday Time, Life Page Section. Yeah! All thank to LiJie from Strait's Time Food Blogging who give us this wonderful opportunity to share our food blogging experience with even more people in Singapore. 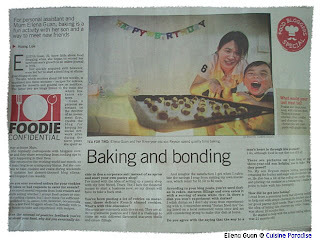 For those who didn't get a copy of the sunday times, and you are interested in the interview details, you can click on Baking and Bonding on Ellena & Reyon to read the articular. From this column, I only can said it really a great experience to share my thoughts and views on food blogging. On the other hand, it's also an excitement for Reyon and I to actually do a home baking and be photograph by a professional photographer. And I had to thank to all those friends who actually went to buy the newspaper to support us and as well as to get more information on our recent progress. I guess I am really into French Macarons Craze..... 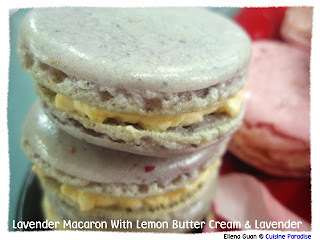 Whenever I saw new macarons flavour from those blogger's site I will be very tempted to try it out. It is just like little kids having fun with the jigsaw puzzle. We can mix and match different kinds of macaron shells with different assorted flavour of butter cream which is very challenging and fulfilment when you do get a good result out of it. Like those blogger who tried Pistachio Mcarons, we had to grind our own pistachio in order to have it as one of the main ingredients. 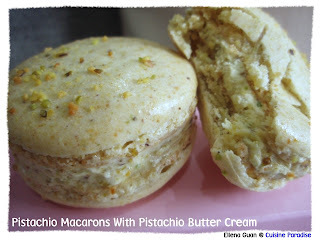 And very surprisingly, ground pistachio do give a very nice colour and fragrant when making into macarons. This round I made a batch of about 15 Pistachio Macarons to pair with 3 assorted Italian Butter Cream which are: Coffee Butter Cream(reyon's flavour), Lemon Butter Cream and most stunning one which is the Pistachio Butter Cream. Out of the 3, I guess Pistachio Butter Cream goes very well with the Pistachio Shell because of it nutty flavour and crunchy bits.